Here’s the most popular 2003-2008 Renault Megane radio from Seicane with the highest configuration and great performance. It is upgraded to the latest Android 4.4.4 operating system and a strong RK3188 1.6 GHz Cortex A9 Quad-core CPU to smooth the operation and enhance the capabilities. 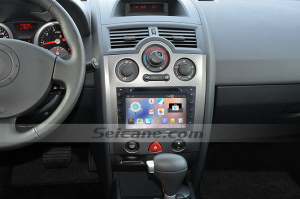 It can support many practical and entertainment features which can meet your different needs, such as GPS navigation, DVD Player, Bluetooth hands-free calls, Bluetooth music, FM/AM radio, RDS, TV, USB, SD, etc. It’s so convenient and enjoyable to have such a multifunctional radio in your car. But you may have some problems in the daily usage. Here I’d like to share some solutions with you to solve some common issues in a car radio. Problem one: the radio can’t be turned on. If you meet this problem, you can check if you connect the battery cable correctly at the first. You can pull out the cable and plug it again to see if it works. If not, please click the reset button on the unit panel. Problem two: the radio can’t get sound. If you find your radio can’t work with sound, please check if the horn cable is connected correctly, or if the horn cable is short out with power supply or machine shell. You can also check if the volume is at the minimum or if the sound format is set rightly when it’s at the TV mode. Problem three: the TV can’t work. When you find you can’t make the TV function work, you should check if you put the TV antenna at the right position or if the local signal is strong enough or if the DTV system is set properly. Problem four: the GPS can’t work. Please make sure you insert an SD card with maps into your radio if it’s the first time for you to use a new radio. After that, you need to install the map in your radio. You can set the GPS path in the settings. Then you go back to the main menu to operate the GPS. After installation, you can enter different starts and destinations according to your different needs. However, if it’s not the first time for you to use its GPS function, you can check if the SD card is damaged. In other case, if you can open the GPS system, but the navigation map doesn’t work well, please check if there’s an interface with GPS antenna from receiving signal. If yes, you can relocate the GPS antenna to get better signal. These four questions are the most common issues during the usage of a new radio. If you have other issues, you can search the internet for solutions or directly ask your dealer for help. Wish it can be helpful for you. This Renault Megane radio with a large 7 inch HD 1024*600 touch screen to simplify the operation and provide clearer display. You can easily find your way to your desired destination with the help of the precise turn-by-turn direction provided by the GPS navigation system. To keep safe during the whole journey, you just need to connect your Bluetooth-enabled mobile phone with this unit, so that you are able to have hands-free calls. Just travel all your trips with this modern Renault Megane radio from now on, you’ll must be amazed at the convenience and enjoyment it brings to you! Good luck to you!